M3rNi3: Pig Out, Chill Out & Let Out! My buddies and I decided to meet up at the eleventh hour yesterday just to "chill out". We planned to meet at Bedok MRT. They had to wait a long time before I arrive as I had to fetch the kids home before going out to meet them. My buddies were expecting me to drive but the rain had dampened my confidence to drive and I took a cab instead. 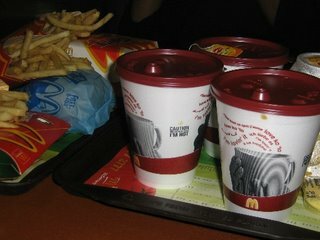 We settled for MacDonald's Cafe, East Coast. With the Extra Value Meals, upsize mind you, and sides like corn and apple pies, the 3 of us really "pig out". 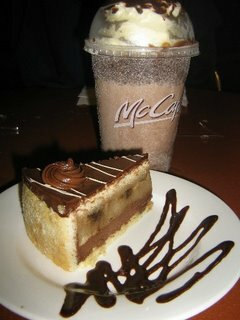 We also had our after meal of Chocobanana Cake and Double Choc Frappe. So while having our after meal, we actually "let out" almost about anything and everything - from work to our own personal lives to marriage lives to other people's lives, etc. We left the place at 11pm feeling lighter really .. a load off our chest.